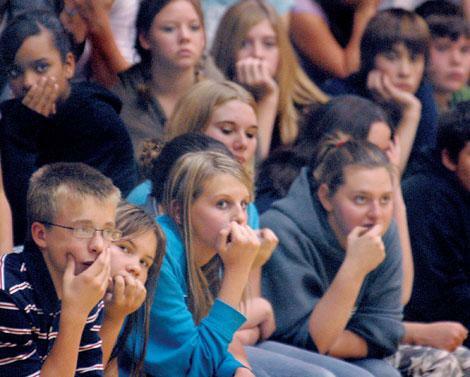 Evergreen Junior High students listen as Patrick Reynolds describes the way tobacco use can destory young lives during an assembly Monday afternoon at the school. Reynolds is grandson of tobacco magnate RJ Reynolds. In the front row are Wade Kyllonen, Jessica Hannon, Andrea Seelye and Brittany Whitley. In the middle row is Richia Egger. In the back row are Travonia Shelby, Danniel Brickles, Justine Winter, Brandon Doty and Tate Carriveau. In the 1970s, Sean Marsee was a 17-year-old high school track star. He’d saved his sister’s life when she fell through the ice. He was piling up track medals and looking forward to a big future. When his mom noticed a bulge in his lip, he admitted to dipping snuff. He tried and failed to stop, many times. A sore on his tongue was only the beginning of his grueling cancer treatments, and his mother’s irretrievable heartbreak. By 19, Sean Marsee was dead. Patrick Reynolds, grandson of tobacco magnate RJ Reynolds, drew a chorus of “ick’s” and “eeuuwww’s” from some 325 students gathered in the Evergreen Junior High gym Monday afternoon when he displayed Marsee’s disfigured after-surgery photo. He did it not for the shock value, but out of compassion. In recognition of Red Ribbon Week in schools Oct. 23-27, Reynolds toured from Somers Middle School to Evergreen Junior High to West Valley Elementary on Monday and Tuesday, laying out the anti-tobacco message. Reynolds stuck home the point that kids need to connect with each other and with their parents, that they need to safeguard their health and enjoy the future. Reynolds himself had watched his own father, oldest brother and other family members die from cigarette-induced emphysema and lung cancer. He vowed to do something about it. As the first tobacco-industry figure to speak out against the industry his family helped build, Reynolds testified at a 1986 Congressional hearing in favor of a ban on all cigarette advertising. He established the Foundation for a Smokefree America to motivate youth to stay tobacco free and help smokers quit. He has campaigned for state cigarette tax increases, vending machine bans, 100 percent smoking bans, laws to limit youth access and reform campaign financing. He confronted members of Congress about aggressive advertising of U.S. brands in the Third World and Asia. On Monday, he got local. Connections were a big theme. He told of his parents’ divorce when he was just 3 years old, and then asked who did not have their biological dad living with them at home. Dozens of hands shot up. He talked of his own anger, sadness and shame at his dad’s absence, and acknowledged they may be feeling the same. He didn’t see his father again until he was 9, when his dad already was debilitated by asthma. Only four or five visits more and his dad was dead. “After that, I dedicated my life to being drug-free for life,” Reynolds said. He cited research that finds 11- to 14-year-olds who simply try cigarettes are hooked in two weeks. “Cigarettes are addicting. Once you start, you can’t stop,” he told them. He asked for another showing of hands. A big majority had seen someone their own age smoke cigarettes in the past seven days. Nearly as many witnessed the same with marijuana. A substantial number had witnessed inhalant or other drug usage. Cigarettes are a gateway to marijuana which is a gateway to “destroying your lives with drug use,” he said. But it doesn’t have to be that way. Reynolds flashed an array of cigarette advertising aimed directly at young people — candy-flavored cigarettes, those that offer a stick radio with the purchase of two packs, packages depicting hip-hop rappers — all in bright colors designed to convince kids that smoking is cool. Smokeless tobacco display racks behind store counters actually are paid advertising to convince people that it is a normal product for all ages, he told a surprised crowd. Seven to 10 years ago, the industry spent $5 billion a year advertising cigarettes. Today, it’s $15 billion. “Why have they gone after our youth? They know that every day in America, 3,000 smokers will quit,” he said, even though 85 percent of them fail within a year. Another 1,200 smokers die daily. With the loss of 4,200 customers a day, “who is the only replacement group the tobacco companies can get for new customers? Yes! Kids,” he said. Communication is key: Tell tobacco companies to stop targeting kids. Tell parents how you feel about them smoking in the house, or smoking at all. He turned the latter into an object lesson by getting two volunteers to learn and then model positive family-talk while being honest about feelings. Reynolds urged teens to face their pain, connect with somebody, talk it over with a teacher or counselor. The future is looking amazing, he said, so kids need to guard their health and face it. They need to believe they can accomplish goals. They need to connect with nature, God, family love or something else instead of material wealth. And they need to build a rock-solid faith.